Should you spend money on a wedding planner? 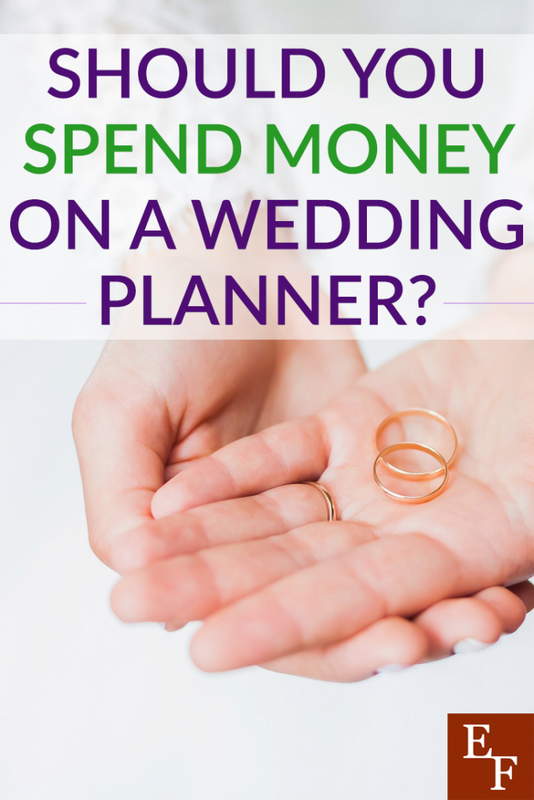 News & Education / Should you spend money on a wedding planner? Planning a wedding is a once in a lifetime experience, but it may also be one of the most expensive events you'll have. My husband and I took about 6-7 months to plan our wedding. But I know some couples who take more time which is totally understandable. It takes time to plan out your spending and cover all your bases. But after a while, it can be overwhelming especially if you're juggling work, kids, school, a social life, etc. On my wedding day, I was so happy to finally marry my husband but I was also relieved to not have to deal with planning anymore. One solution people consider to help alleviate wedding preparation stress is to hire a wedding planner. A wedding planner's role is to professionally plan specific aspects of your big day and do all the research and heavy-duty work that you'd rather not handle. Working with one can provide a huge relief, but on the flip side, you'll have to fork over more money to pay for the services. This leads us to the one question many engaged couples are faced with: should we spend money on a wedding planner? Before you decide, ask yourself these key questions first. Most couples in the U.S. spend at least $1,500 on wedding planning services according to Wedding Wire. For more experienced professionals or a full-service assistant, it's likely that you could pay more. That sounds like a huge investment for someone to help you pick out tablecloth covers and call venues right? Well, wedding planners actually do more than that and therefore their fee is pretty justified. A wedding planner may be responsible for coming up with the theme of your wedding, booking appointments for you, keeping the planning process on schedule, shopping around for the best deals or using their network of resources, and even offering to consult and their expert opinion on the overall logistics of your big day. Wedding planners also may factor in costs like transportation and time spent communicating with you during the planning process. If you spend 6 months to a year working with a planner, the high fee will start to make sense. Yet and still, not all couples will have this type of money to fork over and the cost is a big factor when making your decision. If you simply can't afford to pay for a wedding planner, you'll have to find a way to make things work without one. The good news is that you can still have a fabulous wedding without a professional planner. Is the idea of planning your entire wedding making you feel overwhelmed and stressed out? If you don't feel that you have enough time or energy to plan your wedding or are afraid you'll mess something up, hiring a wedding planner might sound like a great idea. You don't want to be worried the entire time you plan your wedding especially if you don't feel 100% up to it. From one perspective, it can be seen as hiring a contractor. Say you buy a house and have no idea how to put the new floors in. Do binge watch a bunch of DIY videos and struggle through the process yourself? Or do you hire a professional to gain back your time and rid yourself of the stress? You also might want to get to the root of your overwhelm before deciding to hire a planner. Getting engaged can spark a lot of emotions. There's no need to feel rushed to plan a huge wedding and spend money impulsively if you don't have to. If it's a busy time in your life right now, you can always postpone wedding planning until things slow down. At that time, you might feel more capable of doing things on your own. What Do I Truly Need Help With? Maybe you feel overwhelmed about some aspects of your wedding over others. If that's the case, why spend money hiring a full-service wedding planner when you won't take advantage of all the services in the first place? For my husband and I, finding a venue was easy and we did it quickly. I also had a ton of creative ideas for the ceremony and reception thanks to Pinterest. While it was time-consuming to perform research, order things from vendors, and head to appointments, it was also somewhat exciting. My husband and I got on a schedule that allowed us to focus on a few select wedding planning tasks per week. After we broke everything down, it became easier for us to determine what we did and didn't need help with in terms of planning. If you find that you do need help with planning specific areas of your wedding (but not all), you may find it more cost effective to book an hour-long session with a wedding consult so you can bounce around some ideas. What Type of Support Do I Have? When you hire a wedding planner, you're basically paying for support, structure, organization, and maybe some industry expertise. If you can get all of that from family and friends for free, that's a better deal. Instead of hiring a wedding planner, ask yourself if you can delegate tasks instead. This can still take more work off your plate. Your family and friends may be super excited about the wedding and willing to help in any way. Your dad may know someone who you can rent items from for the reception or your mom may be willing to make a few calls to gather quotes for you. My moms love decorating so it was nice to bounce ideas off her and my sister knew a photographer and someone who could print our programs for cheap after she volunteered to design them. I also reached out to an old coworker of mine to help make my bridal party bouquets. Does the Long and Short-Term Value Beat the Cost? At the end of the day, you have to weigh the value vs the cost if you're considering hiring a wedding planner. Assess your situation and consider all the tasks. Decide you how confident you feel in being able to handle it all by yourself. Then, take a look at your budget and determine what you can afford. If you know that you can plan most of the wedding by yourself but things may get hectic on the day of, you might want to consider hiring a one-day wedding coordinator to help things run smoothly. My husband and I ultimately didn't hire a wedding planner and we never really talked about it or considered it. We wanted to save money on our big day and cut out expenses that we didn't think were necessary. We focused on enjoying the time that we were engaged and planning our wedding. This doesn't mean everything turned out perfect. There were times when we messed up or learned the hard way. We were running behind on the day of the wedding and I was so rushed that I ended up walking down the aisle without my wedding bouquet. I took pictures with it afterward, but if I had a wedding planner or day of coordinator, I imagine things would have run a bit smoother. Ultimately, it wasn't that big of a deal when looking at the big picture. It's important to decide what is important to you for your wedding. Think about if hiring a wedding planner will get you more band for your buck and more value or not. This article was written by Chonce from Everything Finance and was legally licensed through the NewsCred publisher network. Please direct all licensing questions to legal@newscred.com. Should I Send My Kid to College With a Credit Card?